Microsoft said Tuesday that it had increased the amount of “bird's-eye” data inside Bing Maps by almost half, as the company tries to keep up with the 3D mapping capabilities offered by its competitors. Microsoft also added to its roster of “venue maps” of stadiums and conference halls. Microsoft’s Bing said that it had added about 270 terabytes of bird's-eye data to its Bing Maps database, versus the 500 terabytes of data that it had already stored. The existing data covered 1,452,958 sq kilometers, the company said. Bing’s “bird's-eye” view captures data at a 45-degree angle, providing a sense of perspective that flat, top-down satellite imagery doesn’t provide. And in places like the suburbs, the bird's-eye perspective offers a better view of houses, which is why real-estate Web sites like Zillow used Bing’s bird's-eye perspective to provide an alternative viewpoint from a traditional maps view. Now, however, Zillow and Trulia, among others, have added Google’s Street View into their perspectives. And Google has not been standing still: A year ago, the company added 3D objects to its Google Maps application. Then, by integrating Maps with Google Earth, users have the option to “tilt” the perspective inside their browser as part of a new Maps application that the company recently rolled out. (In other Google mapping news, the company acquired Waze on Tuesday.) 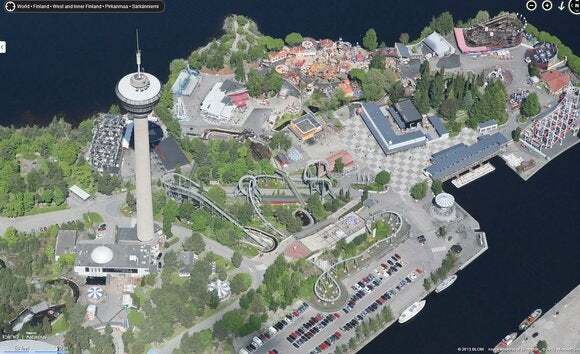 The result is something that looks very similar to Bing’s bird's-eye perspective, but with 3D objects. Meanwhile, Apple’s iOS 6 added a "flyover" capability last year, providing its own 3D imagery to Apple Maps. This view of a Finniish amusement park is extremely detailed. Ugh. Fortunately, this seems like a bug that can be fixed by zooming in or out. A Microsoft spokesperson acknowledged the bug and provided a fix: Zooming in and out autocorrected the rotation feature, eliminating the visual glitches. 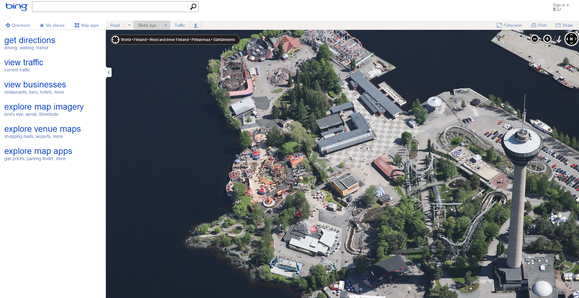 The new mapping additions appear to work just within Bing Maps, the Web app. The "Modern" or "Metro" Maps app using Windows 8 simply shows a map view. Microsoft, Google, and others have also placed a recent emphasis on mapping internal locations, so that users can negotiate the inner halls of a convention center, stadium, or airport. Microsoft said Tuesday that it now maps 4,700 venues in more than 59 countries, covering the tablet, phone, and the PC. Users can zoom in, and then click on an individual polygon to get more information; green indicates restaurants, while stores appear purple, Microsoft said. So far, both Microsoft and Google have basically completed the race to map the globe, both from a 2D perspective as well as via satellite imagery. The competition now is to add a 3D view, so that users can begin to view the world as they do in real life. That race is still being run, with no clear leader at this point.